Your feet are one of the most important parts of your body. They hold you up all day at work and they keep you doing fun things like dancing, hiking, and taking leisurely strolls. If you do not wear proper footwear for everything you do, you may be destined for trouble. Foot trouble can include the painful condition of corns on the feet and toes. What Are Corns on Feet? The area where corns form usually appears discolored and circular. The color can range from white, yellow to almost a grey color. The shape of a corn is like a pyramid, forming a circle at the top down to a pinpoint at the base. The callous is very "leathery" and even flaky looking. 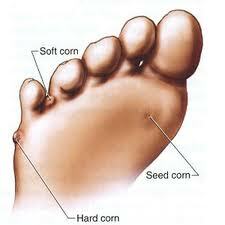 Corns can develop on the toes, balls of the feet and even other areas. It is usually the areas that are exposed to the most friction and rubbing. Corns can be very uncomfortable and even very painful. The pain can be so severe that it can prevent shoes from being worn. These calloused areas are in fact a protective mechanism by the body to prevent infections or damage to the feet. What Causes Corns on Feet? Too much friction and pressure on the bony prominences of the feet is the main cause of corns. In the beginning stages, the body may form a blister from injury, which opens and then heals again. If the pressure is ongoing, the body will continue the healing process by placing more and more skin cells over the injured area. Corns can also develop without an injury. The body will thicken the skin over the area of friction to help prevent open areas and infections. This usually happens over a long period of time. Dead skin cells in the area of friction will not slough off like normal skin, but remain in the area to try and provide a protective cushion. People who wear stiff work boots, high heels or shoes without socks are the most susceptible to corns. Wearing shoes that are not properly fitted or the wrong size i.e. shoe width is also a factor for developing corns. What Are the Symptoms of Corns on Feet? When corns on feet develop, the first symptom is usually a small hardened area near body prominences or joints. If trouble areas on your feet are not dealt with, you will then begin to experience mild pain in the area after wearing your shoes for a period of time. You may feel fine when you first put your shoes on, but start to notice pain after a few hours of wear. If the corns on feet are not taken care of in the early stages, the callous will become extremely thickened and may even prevent you from putting the shoes on at all. Pain can even become severe enough to cause a limp when walking. The appearance of corns can also be mistaken for other problems on the feet. 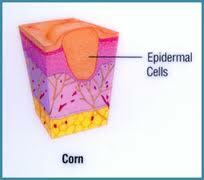 Things like warts, blisters, bunions or pressure wounds can also have a corn like appearance. This is why regular foot inspection is very important. Corns on feet, though not serious, can be really distressing and annoying. Here are some useful home remedies for corns on feet which can help you to manage the pain and take care of your feet better. First and foremost with any home treatments, especially corns on feet, you need to eat a proper and healthy diet to help your body with healing itself. Make sure you are getting plenty of the right nutrients, vitamins and minerals. Also, make sure you are drinking 6 -8 glasses of water each day. Inspect after every shower or bath for signs of corns, warts, blisters or painful areas. The new corn will be tender when you put pressure on it with your finger. Check for signs of infection in areas of increased pressure. Check the balls of the feet, toe edges, joints and even between the toes for anything unusual. 3. Keep feet clean and dry. Even if you do not shower daily, you need to wash your feet daily and dry them well before putting your shoes on. This will help prevent excess bacteria build-up in pressure areas, which increases the body's immune response to build skin cells over these areas. Make sure you dry feet thoroughly to prevent other infections such as fungal growth. 4. Apply some talc powder. Talcum powder can help reduce friction and rubbing. It will not completely prevent corns on feet, but will help keep rubbing to a minimum. It can also help to reduce perspiration in the foot area and keep bacteria down. 5. Try wearing socks at night after applying lotion. If your feet are overly dry, put lotion on your feet at bedtime and wear socks on them overnight. You will wake up to rejuvenated skin on your feet and toes in the morning. At least weekly, give your feet the "spa" treatment they deserve. Soak your feet in a nice foot bath for up to 15 minutes and then pat dry. Try throwing a little Epsom salt, salicylic acid or baking soda in your foot soaks. Trim around the edges of the toenail to remove excess skin. Keep your toenails short and even. 7. Give feet a good rub. Use a lava rock (pumice) to rub off rough areas on the feet. This can also be done with a good foot scrub solution. Make sure when you rub your feet, you pay extra attention to trouble spots. This will help to increase circulation to the area and promote healthy skin regeneration. This is especially necessary in the winter when you run the heat in your home. Dry air can dry out all of the areas of your skin, including your feet. You can use ice compresses to corns on feet to help relieve inflammation and irritation. Swelling can increase the pressure and friction, so it is important to keep swollen areas down. 10. Have your feet professionally measured. One of the first lines of preventing corns on feet is a properly fitting shoe. You need to have your feet professionally measured at least once, and measured again after weight gain, loss or pregnancy. Pregnancy causes the joints in your feet to "stretch" and your feet can become up to a whole size larger after the birth of a baby. 11. Keep your toes apart and relieve pressure areas. Use moleskin or corn pads to help keep your toes separate and relieve pressure areas on the outside joints of the foot. Acidic solutions that are all-natural can help to "melt" away the dead skin cells. Try using lemon juice full-strength or even placing lemon directly to the skin during the night when you sleep. Apple cider vinegar is another natural acid that can help soften corns on feet. Use it full-strength on a soft cloth or cotton ball every day. You will see the corn actually start to dry out and slough off. Never pick at a corn after this starts to happen. Use pumice to remove skin flakes. 13. Apply licorice and oils. Licorice has softening properties. Making a mixture of sesame, mustard oil and ground licorice and placing it on the corn can help to soften the skin. You will notice the size of the corn shrinking over time. 14. Work with herbal and alternative food remedies. There are foods and herbs that can help to treat corns at home. Use of these methods is generally very safe and there are little or no side-effects. An herb called Indian Squill used in Indian Ayurvedic medicine can be placed on the corn overnight. Make sure you roast it well. Papaya and green fig are also useful foods that can help to soften the corn. Papaya juice can be applied three times daily, but use caution as it can be irritating to the skin. One-half teaspoon of green fig juice can be applied to corns on feet two or three times a day. You can also soak your feet in chamomile tea, which helps to dry out the calloused areas and promote sloughing of dead skin cells. 15. Make sure you moisturize your feet. Use a quality moisturizer on your feet to help keep skin soft and supple. Oils such as emu oil, castor oil and avocado oils are great to help keep corns on feet to a minimum. These oils can also help to soften corns once they have started forming. 16. Never cut or pick at a corn. As much as it may bother you, never cut or pick at corns. This may introduce bacteria into the soft tissue of the foot and cause an infection.